All about my newest art form. Software now exists that can take a digital (or digitized) photo and reimage it as a painting. That is, instead of a photograph, the result looks as if it had been painted with watercolors or oils (your choice). You can also control the pressure of the brush strokes, the extent of coverage, even the texture of the virtual canvas on which the painting is made. Combining this with technology that will print a digital image on large-scale canvas or art paper, raises several points. One being: Why? Another being: Is it cheating? This particularly matters to me, as I love doing this, and have been given an opportunity to present some of my work to a gallery owner, with the possible result of being given a show in the spring. First of all, let's look at an example. Here's an original photograph. 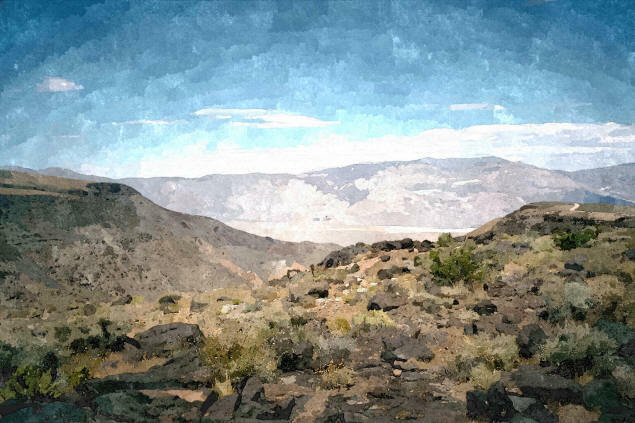 And here's a "painting" generated by computer from that same photograph. Now, this particular photo is, itself, manipulated. 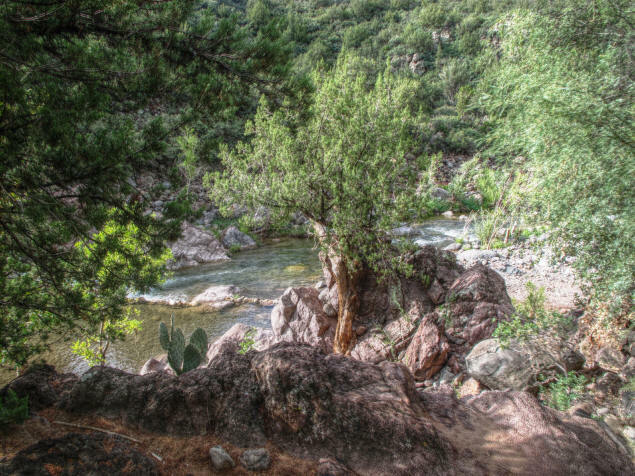 It's what's called an HDR photo, with a wider range of light and dark than a photo can normally capture, compressed so that it can. This is the kind of thing a painter would do without thinking about it, because the human eye can capture a wider range than film or digital cameras can. And of course, the main reason to create a painting rather than simply take a picture, is that, in theory, a painter can "see" more than the camera can. A painter can imbue emotional overtones, emphasizing some elements and not others, for example. A painting can possess "truthiness" that exceeds the mere truth a camera can capture. A computer cannot apply any of these enhancements to a photo, however, unless there's some way for the photographer/painter/programmer to indicate to the conversion program where and how this should happen. No programs I know of provide any such control. Nevertheless. the use of photographic techniques to create paintings has a long history that far predates photography itself. The pinhole camera was first described by the 5th century BCE Mohist philosopher Mo Jing, who in ancient China mentioned the effect of an inverted image forming through a pinhole. Pinhole cameras were also described in the West around 1000 CE, where they were used to project an image onto tracing paper, which was then traced, providing an easy method of assisted drawing. A larger version of a pinhole camera is the camera obscura, which is Latin for "dark chamber". This is very likely a technique used by Dutch painter Jan Vermeer for his series of perfectly composed paintings of interiors. 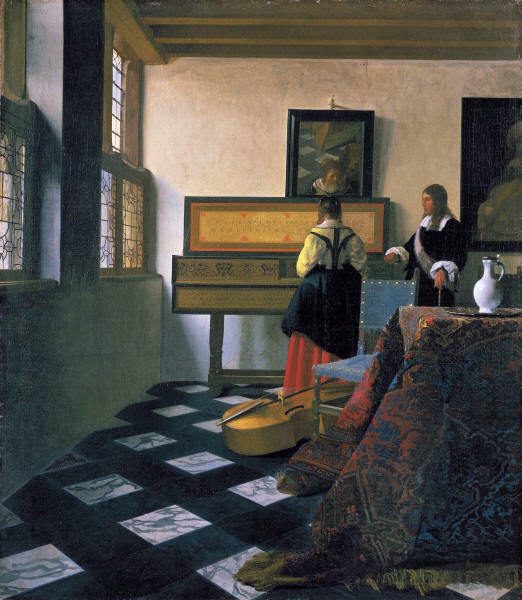 Although he never described using the image from a camera obscura, his paintings have been digitally analyzed and there's really no other explanation for the flawless perspective or the perfect reflections in mirrors that appear in the painting (for example, above the virginal (a type of harpsichord) in the below reproduction of The Music Lesson. In more recent times, many painters have taken a color slide of a scene or subject they wished to paint, then projected the slide onto a canvas onto which they then applied paint. The technique allows for both the capturing of an ephemeral moment, photography's specialty, as well as the painter's emotional veneer to be applied, making the result a work of art. But the coming of digital photography allows for photographs to be manipulated just as reality can be manipulated by a painter. Elements can be added or subtracted; colors shifted, blemishes removed. So why bother with paint, at all? Especially when photos can now be "printed" with paints directly on canvas, for archival and display purposes? If I had to guess at the answer, I would say that it's because people respond differently to paintings than to photographs. I'm not saying the response to a photograph is less than, just that it's different, just as the response to a black-and-white photograph is different than the response to a full-color one is. 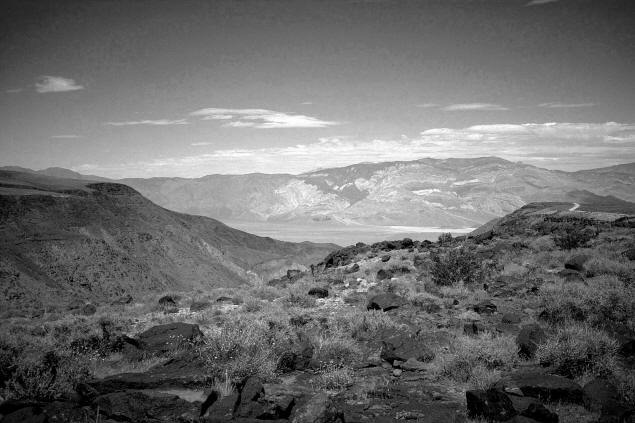 For example, take the following set of pictures, all from the same shot of Death Valley. First, allow me to present the original color photograph, taken on Kodacolor film in 1995. Now, take a moment to appreciate the sere beauty of a monochrome rendition. Essentially, this is the same photograph, with the only difference being the subtraction of color. Yet your response is likely to be quite different. In this case, the "truthiness" of Death Valley's heat and aridity and loneliness is emphasized. Even the vastness of the valley itself, beyond the foreground ridge, seems bigger (at least, to me). Now, here's the same photo, rendered as a watercolor. To me, I immediately perceive this as more fanciful than the photo. These days, any photo can be faked, so we have grown to be a little suspicious of photography. Paintings, on the other hand, don't pretend to represent actual reality; so we aren't on our guard when viewing them. Because paintings provide less definition than photographs, many details are lost. For example, the delicate veins of the slopes at the far side of the valley, clearly visible in the photographic versions, are lost in the painting. This throws emphasis to the rocky foreground ridge. While the vastness of the valley is no longer so clear, the barrenness is emphasized. The plant life seems more desperate, more precarious. The rocks seem less "just there" and more like they've been carefully placed. Not all photos lend themselves to being manipulated in this way. 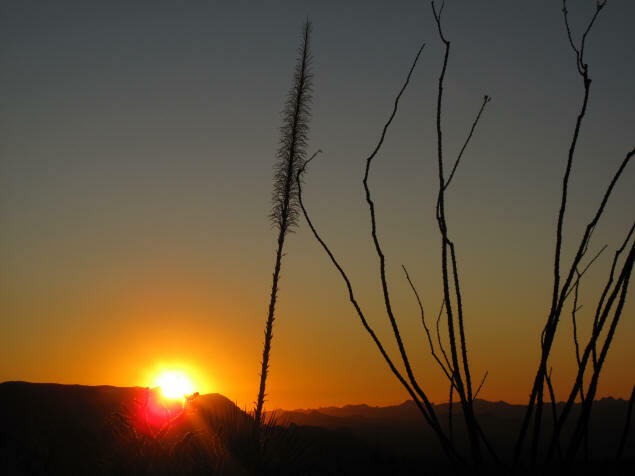 For example, I took a series of sunset pictures on the Apache Trail about 20 miles from my house. These are digital photos, which means there's no film "grain" (the bits of tiny blemishes visible in a photographic enlargement or through a magnifying glass). Converting the photo into an oil painting has the result of introducing something analogous to grain, imperfections in an otherwise breathtakingly smooth sea of color. While the oil version isn't objectionable, to my mind a large canvas Giclée print, with no artifacts other than the weave of the canvas itself, would be the way to go with this picture. There are those who pick a medium—oils, acrylic, photography—and stick to it. There are others who pull in pieces, willy-nilly, using any tool they can find to produce the effect they want. I'd be one of those.